We will have an initial conversation with you to understand your needs and logistics. Obviously all of these items have suggestions, based on our initial understanding of your needs, so there will often be little to do at this stage! Alternatively you can design your own questionnaire or spend a day with one of our consultant partners who will help you create a new program, tailor made to your needs. Effective communication with both participants and feedback-givers is key to success of a 360 degreeproject, to ensure both the right quantity and quality of feedback. Where we are working with a direct end-client, the typical timeline leading up to the report production date is as follows. Project Invitation: (-5 weeks) We (or you) send an invitation to all participants introducing them to the process and providing them with a simple spreadsheet to complete with all their suggested feedback-givers. Use of drop-down menus ensures that the relationship categories are consistent and accurately entered. Participants are encouraged to send a note out to their feedback-givers to thank them in advance for their feedback and ‘warn’ them that they will get an email from us to reduce the chance of emails being junked. Feedback Reminder: (-1 week) Anybody not completing their feedback is sent an automated reminder. And throughout we will be there providing that all important human element of support by e-mail and phone from beginning to end. Effective communication with participants and feedback-givers is key to success of a 360 degreeproject, to ensure both the right quantity and quality of feedback. Where we are working with a training or coaching company, the typical timeline leading up to the report production date is as follows. Project Invitation: (-5 weeks) You send an invitation to all participants introducing them to the process (we can help with suggested wording) and provide them with a simple spreadsheet to complete with all their suggested feedback-givers. Use of drop-down menus ensures that the relationship categories are consistent and accurately entered. Participants are encouraged to send a note out to their feedback-givers to thank them in advance for their feedback and ‘warn’ them that they will get an email from us to reduce the chance of emails being junked. And throughout we will be there providing that all-important human element of support by e-mail and phone from beginning to end. 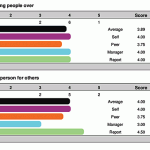 Numeric feedback is provided using slider score options which are fully customisable. Text questions can be included anywhere in the questionnaire. 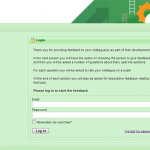 Feedback-givers and participants have a password which they can easily change to their own memorable and secure code. Get in touch today!Providing ‘no-hassle’ learning and development tools which deliver measurable results!